I wont go into the whole concept of geocaching here as its easy enough to google, but on one of our adventures we came across Fairy Glen. 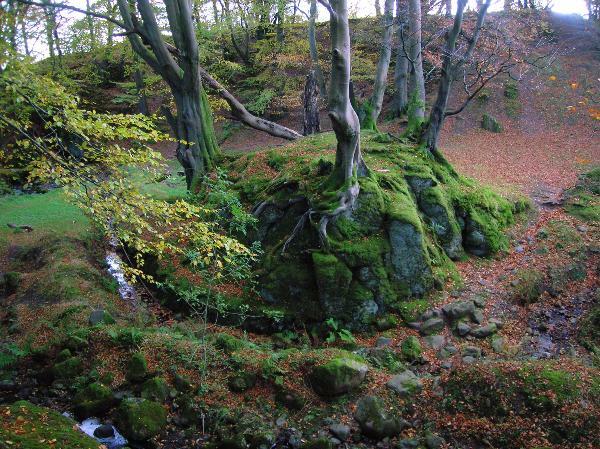 A beautiful spot in Ayrshire hidden away from main roads and paths. You have to really want to go there if you are to take the time to find it. It is down a small hill in an area concealed by am amphitheater of trees, a place of untouched beauty which resembled a cathderal of nature. We then noticed part of a car body in one corner. We were amused when we noticed that Mother Nature had slowly began covering the red car part in ivy and weeds, making it blend into the scenery. There were some large Fly Agaric Fungi next to some fallen trees, themselves covered in odd looking toadstools and moss. To the side ran a small brook with clear glistening water. I fell in love with it all. This place was truly magical. After finding our treasure the three of us wandered in different directions doing our own thing, none of wanting to leave this special area. I sat on the mound and went into a state of meditation. meditation is important in any magical work where a strong intent is needed, as well as being a perfect way to relax. While meditating at Fairy Glen I thought more about what I would do now that my HP had left and any coven work would now be undertaken on my own. I could not pass on My Gardnerian lineage to another woman so I would have to re think any coven structure, lessons and possibly lesson contents. I also decided I wanted to make my coven more spiritual in beliefs and include Gerald Gardner’s other loves of African Witchcraft and Tantra. Having received a Diploma in Tantra made it easier to come up with suitable lessons to make the coven run with a mixture of a Gardnerian basis with Hoodoo, Tantra and Spirituality. The mixture would reflect the way Ayrshire Wica worked when my High Priests were alive and I would build on that. The only main difference being lineage passing from woman to woman. It would involve re-writing some of the rituals to reflect this and completely re-writing the three Initiation ceremonies. My original Gardnerian Book Of Shadows would remain as the core of Ayrshire Wica, Gardner’s spelling mistakes included. I wanted that to remain true, everything else we had worked on and was not attributed to Gardner would complete the work of my new coven, my new branch of Gardnerian Wica. Dusk came and we had to leave our special spot, but I would return for many other special moments in natures cathedral, my new outdoor temple.